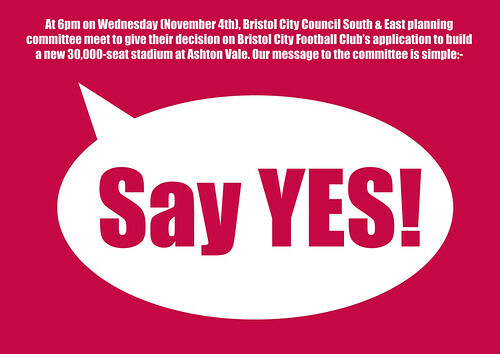 Bristol City FC are ratcheting up their pretty blatant efforts to lobby members of Development Control (South and East) Committee in advance of the crucial stadium planning meeting on Wednesday. They’ve even gone and put together a little ad campaign (above). This follows hard on the heels of the club’s Chief Executive, Colin Sexstone’s desperate public pleas from the pages of the Evening Cancer and the club’s website about their random ‘Southlands’ housing development at the back of their Ashton Vale stadium site, which has been recommended for planning refusal by city council officers. Is Sexstone trying to use the media to bypass planning officers and talk “directly” to councillors who will be making the decision by any chance? And is he perhaps trying to persuade them to ignore the officer recommendation over the “Southlands” development? But is talking over the heads of planning officers and directly to officially objective members of a planning committee really such a wise idea? If this “Southlands” site is so crucial to the development and the club thought that their financial appraisals proved that, then wouldn’t the developers be confident of overturning any planning decision on appeal? But one of the extraordinary features of this whole affair, so far, has been the ease with which Bristol City Council have allowed Lansdown and Sexstone to shroud their financial plans in absolute secrecy. The situation is so absurd that the councillors sitting on the planning committee are being asked to make complex financial judgements on the basis of a short report of an appraisal of a business plan. Of course, were this application to go to appeal then it would become part of a judicial process and it’s highly unlikely a member of the judiciary will share the city council’s daft view that a soppy little business plan for a crappy little housing development should be kept secret. This means Lansdown’s controversial “financial appraisals” are likely to go into the public domain and get torn apart. Particularly as there’s a £50m disagreement over valuations implied in the officer’s report to the planning committee. However, perhaps what the club doesn’t realise is that if the members do as the club seem to want and decide to go against their officers’ recommendation – negating the need for an all-revealing appeal – officers have made it quite clear that members can only do so on the basis of the ‘very special circumstances’ where the benefits of the stadium project clearly outweigh the harm. The ‘very special circumstances’ for the “Southlands” housing element of the stadium project is as an ‘enabling development’ or “that it is development necessary to assist the funding of an intrinsically unviable stadium”. This is essentially a financial consideration and if members approve it contrary to officer advice they are effectively saying that the officer’s view of the financial appraisal is flawed. This means that if the planning committee members go against the officer recommendation they are effectively saying that the financial assessment by their planning officers and their professional advisers is in some way flawed or that the financial information was insufficient or that the assessment was incorrect. This then offers up the potential for judicial review in the courts and – just like an appeal – the financial appraisals will be put in the public domain. Moreover, if a judicial review finds against the council then, it could make the council liable for damages to the developers if their decision is overturned. The councillors on the planning committee will certainly have all been trained and fully briefed on the legal implications of their role. So it would be very surprising if they put the council at risk of being taken to judicial review and effectively get shot by both sides with a hefty bill for the pleasure. Better to go with the officer’s recommendation and let the developers go to appeal (if they really believe their financial case is strong enough) where the decision is then made by an independent inspector and the council’s financial commitment is limited to the costs of the appeal rather than the potentially open-ended costs involved with being found guilty of maladministration at a judicial review. This entry was posted in Ashton Vale, Bristol, Bristol Evening Post, Bristol South, Developments, Environment, Local government, Planning, Politics, World Cup 2018 and tagged Bristol City FC, Colin Sexstone, Development Control (South and East) Committee, Southlands, Steve Lansdown. Bookmark the permalink. hmmm, let’s hope Bristol council tax payers don’t end up part-funding a new stadium (or development), just like those poor tax payers in Bath who had to stump up the cash for the under resourced and over scheduled Bath Spa. Of course, following the strictures imposed by the Local Govt Ombudsman on the Council because of the Mem Stadium planning irregularities, Cllrs will indeed be fully trained and briefed (like rather more than 2 hours to read the papers). And the Officers will not be starting the meeting by pointing out how Elected Members could be at personal financial risk if their decision is challenged. And the Chairman will not allow the meeting to continue if any Member is spooked by such warning, should it be issued. And, in the public session, only those with direct local interest will be allowed to speak (I do hope that someone takes along a pet otter to show how cute they are). At the meeting, watch out for the conduct of BCC head of legal Mr McNamara. Councillors will do and decide exactly what he tells them to do. Countryside and other open land around the existing built-up areas of the city will be safeguarded by maintaining the current extent of the Green Belt. Land within the Green Belt will be protected from inappropriate development as set out in national planning policy. Oh dear, I have been banned from posting on the Evening Post because I said they were biased in their reporting about the Stadium. However I expect they didn’t like the fact I said they had a low readership. Truth hurts doesn’t it? We are witnessing a pretty blatant perversion of local democracy and the planning system. The pressure being brought to bear by the Evening Post in concert with BCFC is unprecedented and goes way beyond legitimate partisanship. The stadium proposal is a battering ram to break down the Green Belt protection at Ashton Vale, opening up large areas for development which is what the Ashton BRT and South Bristol Link Road are predicated on too. Too true. The article last night listing the planning committee members along with their photos and home addresses was unashamed – and dangerous – bullying. “WE KNOW WHERE YOU LIVE”. Chris: Yes, they are CREATING the demand (and justification) for BRT by increasing the population of South Bristol, which in-turn will require better transport infrastructure – the perverse world of the political relations between developers and planners, driven by the demand for jobs. Most people, I think, who truly value Bristol see its adjoining green belt borders as one of the city’s prime characteristics, and indeed the way this contributes to our quality of life. It is completely bizarre to even contemplate wanting to ruin this. What ever happened to the idea of building a “superstadium” out near Avonmouth? Wasn’t the land given to BCC by ICI for that purpose, or is my history too flaky? Surely a largely industrial area like that is the perfect place? What about the Arena site? – one decent stadium for both footy clubs as suggested by Ian Holloway, not built on greenbelt. – I know it won’t happen, but it perhaps is what should happen. They had better be prepared for a protest camp if they do try to build it on Greenbelt! What size was the arena site? If it was big enough, then why not? It had excellent transport links with Temple Meads station, you could have had a shuttle service to a park & ride with a dedicated station. As I understand the the only reason the arena wasn’t built is that the SWRDA decided they didn’t have enough money, which is fairly ridiculous when you think about how much they spent on investigations and proposals into the site. As a cabinet member I take no part in planning but it was easy to see that members were genuinely torn between the desire to get a good facility and their desire to protect our environment. The planning matters are not yet finished. The comments about the arena are very pertinent because that should now be deliverable if the stadium is built.As has been said the RDA spent a huge amount of time and money at Temple meads but produced no arena. They now have a golden opportunity to actually help us to deliver one without any cash cost to themselves. We will need cooperation from the club but as they have already said how keen they are to help provide facilities for the Bristol public that should not present a problem. Presumably you have thought this though before posting. If so I imagine you have some idea of what would comprise a suitable site for an Arena that is within the club’s ability to gift? Presumably not “Southlands” given the lack of transport links to that part of the site, and the enhanced ecological value also assigned to that part of the development. I say this because “Southlands” was the only part of the application completely rejected, and your comments might be interpreted as an attempt to look to build something else there now that the housing has been rejected. In other words to up the ante with something that might outweigh the evironmental benefits of leaving the site as it is. the site was ruled out fgor some health and safety reasons relating to all the other activities at Avonmouth – a big bang could take out a whole stadium full of football or Rolling Stones fans. Gary. The overiding factor as to why the stadium was a special case, allowing development on the greenbelt,was there was no other place within the city suitable. With the Temple Meads site still available how could the same be said for an arena? After taking part in an evening of pure fantasy, with junior Councillors and few credible green credentials, they seemed barely able to understand what green belt is, let alone be custodians of it . The suggestion that if the red building was just a slightly different shade of red it would mitigate against a seven story building twenty feet from a rank of houses demonstrates the level of analysis given. The master plan is now clear, the Southland housing site which has been turned down, to great non genuine protestations by BCFC, will as if by magic, emerge as the site for the proposed Arena. Now our planners have done their work, by opening up the Green Belt, they will of course now argue the precedent is set. With Planners and Councillors prepared to sell off our heritage, who needs greedy developers. Yes I have thought it through and no the arena would not be built on the Southlands site but closer to the stadium and raised on stilts to avoid the drainage problem that would otherwise result. There has been work done on the environmental impact but that would have to be thoroughly tested. Why here and not Temple meads? 1 Temple meads would be expensive to develop and although it would benefit from train access(that could be introduced to Ashton) the traffic situation at TM would be a nightmare. 2 The RDA could not get the scheme of the ground at TM. 3 There is a synergy between the stadium and the arena. 4 There is a developer/operator waiting to build if they can get the land at Ashton with no other subsidy. But it still does not pass the greenbelt test of no other available site. Also it was stated at the stadium planning meeting that there would be no rail access! The only thing on stilts here is the nonsense Gary’s talking. Arenas rather like stadia can only be built and run at a loss. That’s why it’s never happened at Temple Meads. If all it took was a bit of free land then there would be an Arena at Temple Meads by now. Such a project would require public subsidy (even if it’s a hidden one like the stadium) or more bloody enabling development. The person set to gain out of this one is Merchant Venturer John Pontin who owns the land to the south of the stadium that’s being used for flood defence (and is therefore currently worthless to him) and the Southlands site that’s been refused planning permission (and is therefore currently worthless to him). Fancy! A new scheme appears for Pontin’s land before the ink’s even dry on the denial of his application to develop his greenbelt land. If the arena is built on stilts over the wet lands it could host naval battles in the manner of the Roman Circuses – http://bit.ly/2qN3up. We really are turning into the Bread and Circuses society. 69 queries in 1.144 seconds.